With summer time and bathing suits just around the corner, my husband and I are trying to lower our bread/pasta intake. So, tonight, instead of eating burgers the traditional way (with buns), we decided to put our own spin on a turkey burger. I present to you the Turkey Burger Bowl. 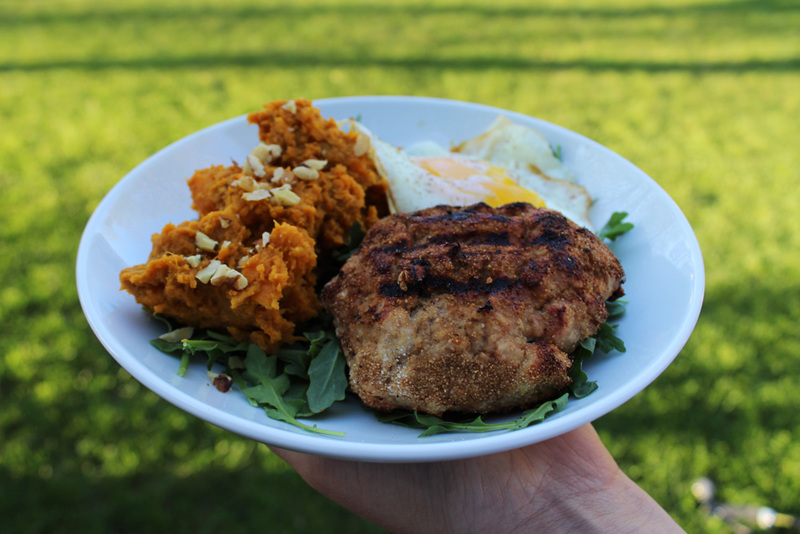 We had planned on making turkey burgers and topping it with arugula and a fried egg, with a side of homemade sweet potato fries… Butttt, we put on our thinking caps and came up with this instead – it was just fabulous. 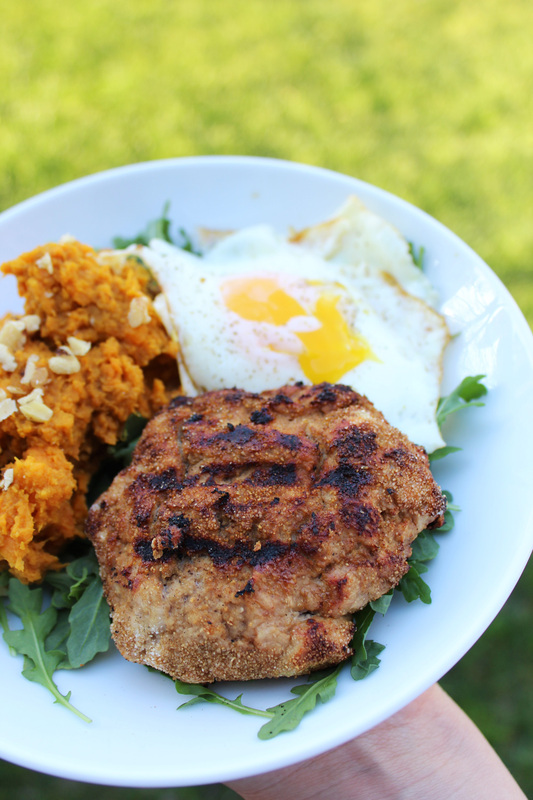 We still made our burgers on the grill the same way, and then decided to do everything on a bed of arugula, which included a side of mashed sweet potatoes and a fried egg. This is similar to the Pinch of Yum Healing Bowl I made a few weeks ago (see below), and click here for the recipe. 1. In a large pan, heat the sweet potatoes and 1 tbsp olive oil over medium high heat. Then add the turmeric, garlic clove and beef broth. Stir well. 2. Let this simmer until the broth is absorbed and the sweet potatoes are soft enough to mash. 3. Sprinkle with some crushed walnuts. 4. Heat up the grill. 5. In a mixing bowl, combine the ground turkey, 1 tbsp olive oil, corn meal, and 1 egg. Form patties and then place on the grill ( About 3-4 minutes on each side). 5. 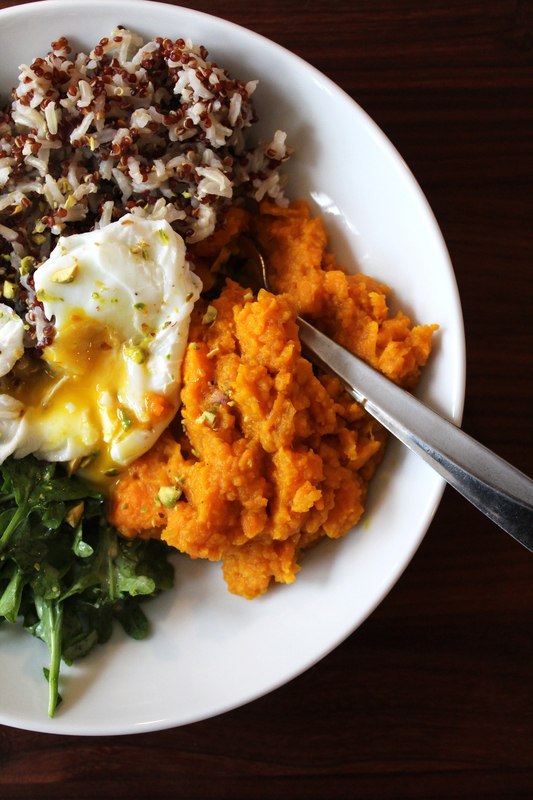 Time to assemble: bed of arugula, followed by the turkey burger, mashed sweet potato, and then place the fried egg in there.